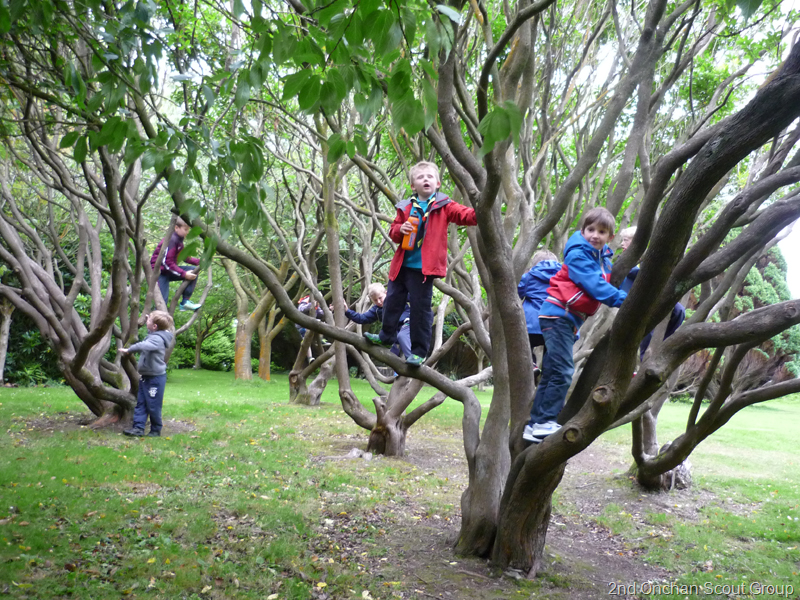 Thursday Beavers had a great time at the Arboretum. We managed to dodge the showers as we explored the Arboretum in St John’s. There was lots of interesting things to see, but the trees were a definite favourite for Beavers and young Leaders! It is nice to see Alex settling in as an Assistant Beaver Leader in only this, his second week. He even managed a cheer from the Beavers and seems to have a good sense of order and control and they lined up for their biscuits! Was lovely to chat to some of the new Beavers and their parents – thanks for coming along and staying to support the event. Well done everyone – a fun night! We were very fortunate and the rain held off for the afternoon! 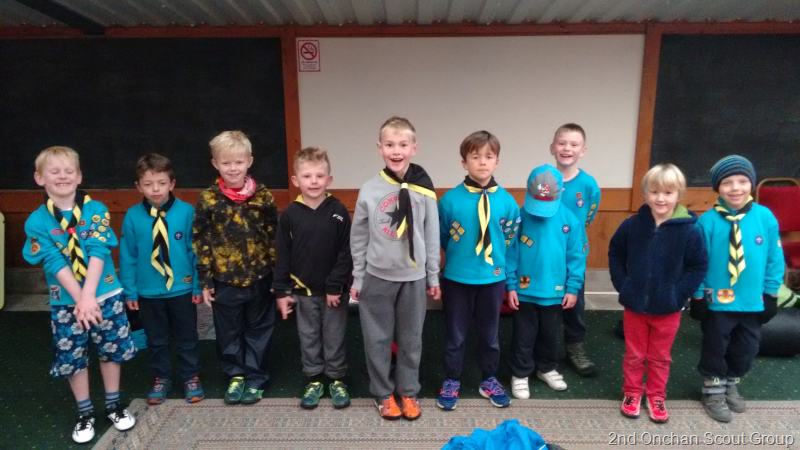 Eight Beavers turned up at Braddan for our next Leg of the Beaver Three Legs Challenge. This was the final Leg for Joshua, Juan, Patrick, Samuel, Rowan and our Leader Rob Clynes – very well done to all you guys. You will all receive your Three Legs Challenge Badge when we are next in the Scout Hall. Well done also to Joe, Sam and Oliver for completing your first Leg of the Challenge from Braddan to Crosby! You have gained your Hikes 1 Activity Badge. It was also a winning performance this afternoon as we completed the Leg ahead of other Colonies for the first time (we can usually be found wandering along at the back)! It was an open road ahead, and I think the threat of rain helped, along with Patrick’s determination to get there first – so extra well done to Patrick, Rowan and Oliver – the first Beavers to finish the walk! The clouds threatened, but the odd shower didn’t spoil our fun at the Maize Maze. The Beavers, Leaders and parents had a great time trying to find the centre of the maze. Despite rumours that it was easier this year, a few participants struggled to reach their goal and some crafty short-cuts were required! Another fun evening, and another activity ticked-off the new Beaver – My Adventure Challenge! 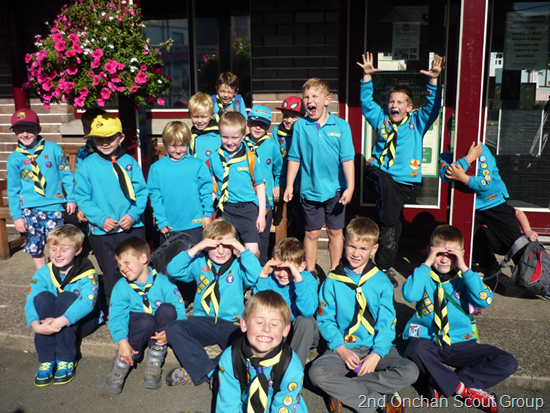 Twelve Thursday Beavers and 9 Tuesday Beavers arrived at the Douglas Tram Station on Saturday ready to start their journey up to Ramsey to join the Cubs and Scouts at the 2nd Onchan Group Camp! We were blessed with a warm, sunny day and some very happy and excited Beavers embarking on their first sleepover adventure. We were greeted at the Ramsey Tram Station by the Camp Organisers and two minibuses, which took the Beavers to the Crossags Campsite just past Ramsey Grammar School. 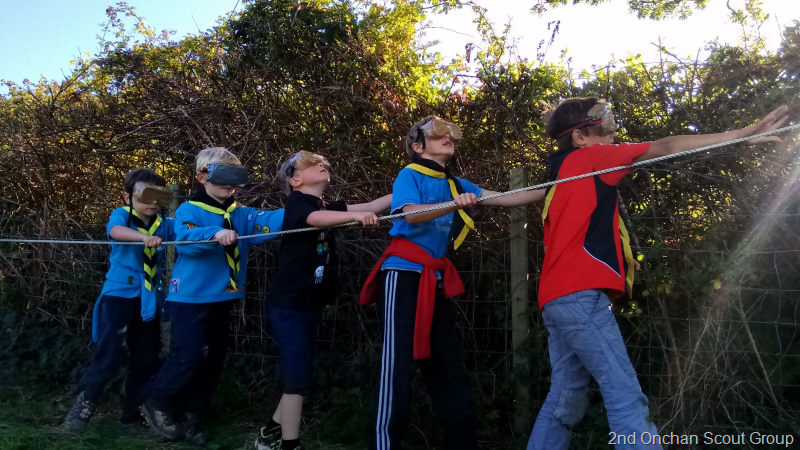 There was no holding back as the Beavers went off to explore some parts of the campsite. 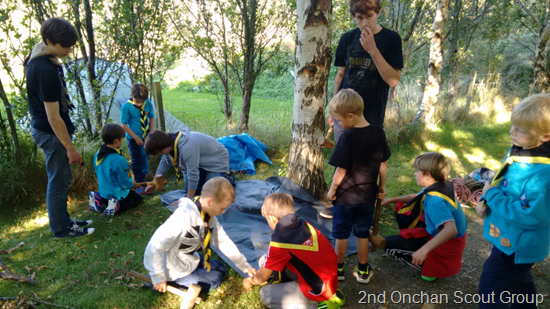 The Onchan Explorers provided seven activity bases for the afternoon – this covered the requirements for the new Beaver Camp Craft Activity Badge. There was bivouacking, blind trail, minefield, fire lighting, backwoods cooking, putting up a tent and first aid. Then there was time for a quick game with the Cubs before burgers and sausages for tea. The day visitors were then collected by parents and those staying for the sleepover (5 from the Thursday Colony and 5 from the Tuesday Colony), grabbed their swimming kits and headed off in the minibus to Ramsey Swimming Pool. Still not tired – they spent an hour splashing around in the pool before heading back to camp. 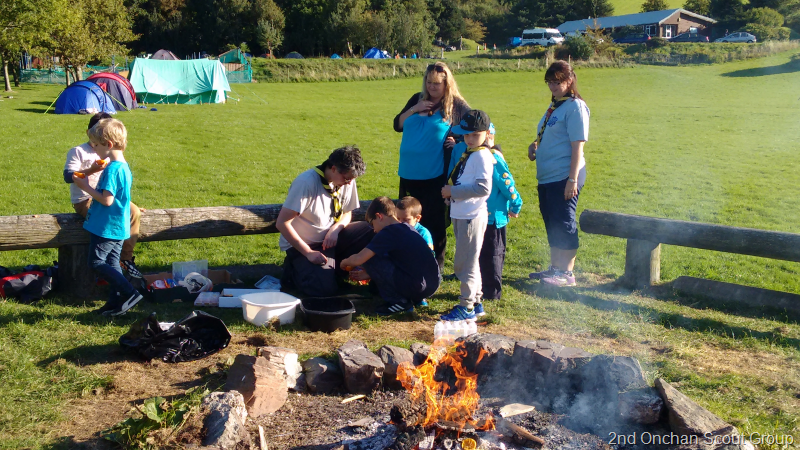 The Beavers then set up their beds, collected their cups for hot chocolate, cake and biscuits, and later joined the Cubs and Scout around the campfire for some songs and scary stories (but not too scary for Beavers)! Then it was time for bed! After some torch shining, visits to the bathroom and general excited-ness, the Beavers dropped off to sleep one by one, and all was quiet by 11pm! Not a single tear at bedtime from any of the Beavers! The next morning it began again with breakfast of toast and sausage and cereals. 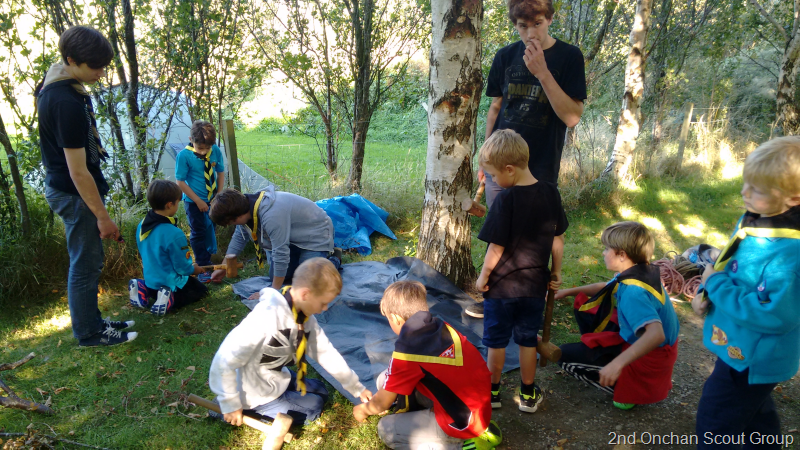 There was time to pack their bags and go exploring round the campsite – looking at the building where the Cubs were sleeping and the Scout tents which were being inspected. Then it was a walk to Sure Strike Bowling with a quiz on the way, a minibus then took us back to the campsite for a baked potato lunch with cheese, beans and /or spaghetti hoops followed by choc ices. Just time for a tidy up and flag down, before the bags were taken to Ramsey Grammar School and the Beavers, Cubs and Scouts walked down the lane to be re-united with parents! Thursday Beaver of the Camp without a doubt – Samuel C. Often overlooked as he quietly gets on with things, but his name was rarely spoken over the camp for all the right reasons – so a clear winner. However I must say Cale and Rowan (both only 6) triumphed on this their first camp – full of confidence and smiles. Fynn and Joshua both loved to explore and had a great time, and will be ready for the challenges of Cub Camp, I am sure, when they move up over the next couple of terms. Our thanks to Steve and Will and the Onchan Explorers for organising the camp and activities – what a way for these Beavers to start their Scouting adventure, and how promising to see Beavers from the 2011 Group Camp now camping as Scouts! 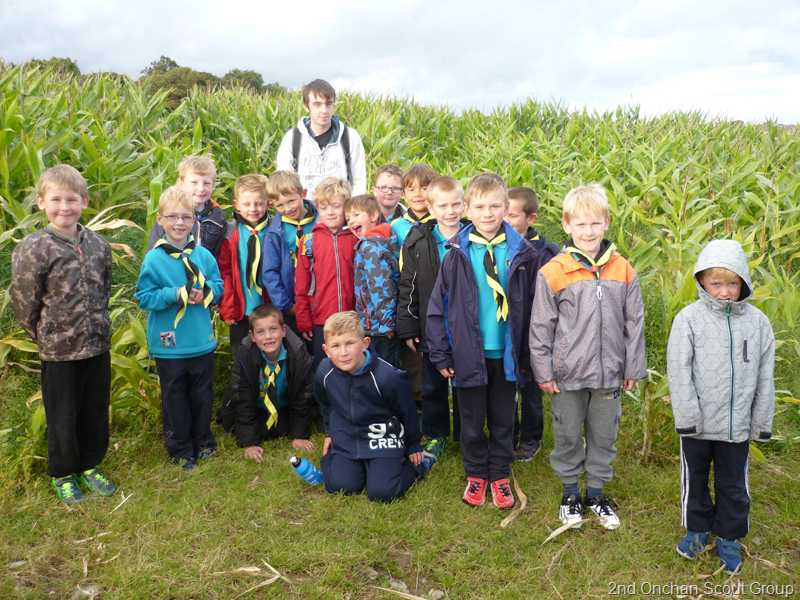 Tagged Group Camp, Maize, Three Legs Challenge, Thursday Beavers. Bookmark the permalink.